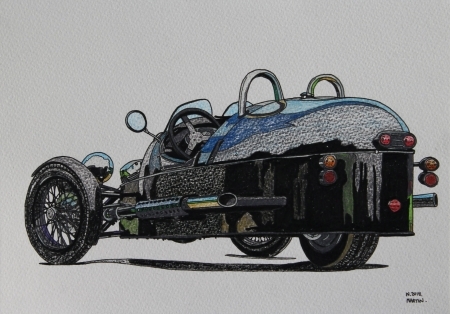 My hand-drawn drawing of a Morgan Three Wheeler, using watercolour pencils and pen on watercolour paper. Please contact me if you would like a drawing of your car. and the normal price for an A3 size drawing is from £100, the reduced price for Talk Morgan members is from £80 (plus £7.00 first class Signed-for p&p within the UK). I can also post abroad. I wish I had your talent for drawing. I am having artist's envy. Delighted to see that you are still with us and busy.